Fanciful image of electronic nose: image via medlaunches.com Perhaps the stories that dogs and cats could sniff out cancers and other serious illnesses in their owners left cancer researchers feeling like they missed the boat somewhere.... Because in the last few years, they have been working with various 'electronic noses' and sample collection methods to come up with their own sniff tests for cancer. This latest study, conducted by a team from the Technion Israel Institute of Technology and published in the British Journal of Cancer, comes the closest to surpassing the animal sniffer model in performance. 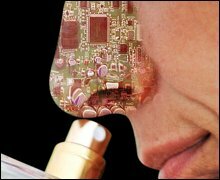 Although only tested on a small group of volunteers - 177 - the results showed that an electronic nose "can distinguish between healthy and malignant breath, and can also differentiate between the breath of patients with different cancer types," according to Professor Abraham Kuten, co-author of the study. Of the 177 volunteers, some were in early stages of cancer, some in later stages, and others who were healthy. Sensors in the electronic nose were able to detect chemicals in the breath that were indicative of the type of cancer (lung, breast, bowel, or prostrate cancer), the approximate stage of the cancer, and those that were cancer-free. along with imaging. It could also be an easy way to assess and monitor the effectiveness of cancer treatment and detect relapses earlier." Lung, breast, bowel, and prostrate cancers are the most common types of cancer, but it is hoped that one breath test could be developed to detect all types of cancer, and early in their development. If the results are reliable and the methods inexpensive, the electronic nose could be used by general practice physicians to test their patients on a regular basis. Right now, cancer detection methods are too expensive to be used unless cancer symptoms appear. Sources: Medical News Today, British Journal of Cancer, An Artificial Nose for Early and Rapid Diagnosis of Cancer, Can animals detect cancer in humans? 12 articles, Can pets sense illness?